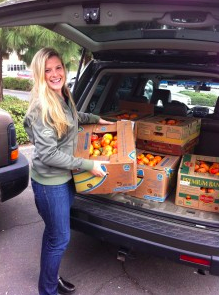 This service highlight was originally posted by the California Farm to School Network and was written by FoodCorps Service Member Shannon McDowell, who is currently serving with the Center for Healthy Communities through California State University, Chico. Within less than a year, Shannon has spearheaded the Harvest of the Month program where she sources and delivers an upwards of 5,000 tastings of local fruits and vegetables from nearby farms in the North Valley. Read on to learn about Harvest of the Month and how it operates in Chico, California. Oh no, the farmer is late. It’s almost noon, which means we only have two hours to weigh, wash, slice, and count out 6,000 kiwi tastings. There are four of us in the kitchen patiently waiting with cutting boards, knives, and strainers ready for the kiwi farmer to arrive. It’s 12:15 pm and we see the farmer pull up. We thank him and quickly get to work. Panic starts to set in when one intern has to leave early, but somehow the panic makes us work faster and we finish preparing all our kiwi tastings by 2:00 pm on the dot. The Harvest of the Month program through the Center for Healthy Communities (CHC) in Chico, CA is unique in that the program caters to over 20 school districts in five different counties and serves upwards of 20,000 students throughout the North Valley. We provide each student with a ready-to-eat tasting, as well as take home recipes and farmer information. Sheila McQuaid, the FoodCorps Site Supervisor in Chico, as well as the Farm to Fork Coordinator for CHC has a true farmer aura to her. Being a past tomato farmer, she has an extensive network of local farmers from around the Chico area with whom she supports through our Harvest of the Month program. She procures produce from them at the same price they would sell to anyone else simply because she wants to support them and what they do as best she can. Once the produce is procured the farmer will then deliver (or sometimes we will pick up) the featured local produce and bring it to the production kitchen for preparation. Here’s where a lot of emotions start coming into play. Whether it be that the farmer is 45 minutes late dropping off the produce, two of the four student interns or staff have exams that day and must leave early, or its 2:00 in the afternoon and we’ve come up short on our tastings estimates and have to improvise – you’ve got to be ready for any situation. Sometimes preparation in the kitchen can be as easy as counting out one tomato per student. Other times preparation in the kitchen can be much more difficult such as the preparation of organic kale where each leaf must be inspected for aphids, aphids taken off, rewashed, and then weighed out to equal 0.01 ounce per student. Days like that will leave you itchy for hours and thankful for almonds next month. While the produce and the method of counting tastings for each student differ every month, they generally all end the same way. By the end of preparation days tons of boxes filled with fresh, local produce wait patiently to be delivered the next morning. Delivery starts early – 7:30 am three Thursdays a month. For the normal working person this isn’t generally a problem but sometimes finding dedicated and reliable college students to wake up early enough can be a struggle. The first delivery of the new semester is always a good way to tell who can be on time, early, or late. Thankfully, most students are very dedicated to their internship or staff position at CHC and very few have shown up late or not at all. Once everyone arrives the boxes get loaded up into cars with corresponding packets and get shipped off to the designated school with 2-3 inters or staff to help deliver. Once at the school the fun part begins. Each intern or staff takes several bags to their corresponding classrooms and drops them off. Now, this can go one of several ways when delivering produce. Most of the time when the students see you walk in wearing your “I Love Fruits & Veggies” shirt, or in my case my purple FoodCorps shirt; you usually hear a multitude of “oooooh’s” and “ahhhhh’s”. Then you might get the kid who says “WHAT IS THAT? !” with a horrified look on their face. After explaining this month everyone is trying kale most kids will say, “I love kale!” or “oh...” but rarely any “ew’s”. One of my more memorable experiences was when I was asked what kale tasted like and when I responded, “a little bit like broccoli”, the small girl in kindergarten responded by saying with a sad face, “Well then why would you give it to kids?!”. Despite a few funny comments about kale our Harvest of the Month program is widely accepted and appreciated by both students and staff members. Students are always excited when we come into their classroom and we almost always get positive feedback from the teachers distributing the tastings and materials about how much their students loved the local produce. Upon arriving back to CHC after a long morning of hauling what might be hundreds of pounds of mandarins or about ten total pounds of kale (on the lighter months) I always stop by my supervisors office to tell her success stories of that weeks delivery. We laugh about funny comments from students and teachers. She listens when I tell her my concerns about how one schools classroom numbers might not match up on the packets and the tasting bags making for a rough delivery for that crew of students. Overall our reflection time is there to enjoy how great the Harvest of the Month program is and to work to make it better in any way we can. The Harvest of the Month program is a truly simple concept with so many benefits. Students receive local produce in its most natural form and get to make their own inferences about it. The sheer size of our program plays an important role in our local economy with our farmers. Teachers and students learn about the produce and the farmer and in turn have actually begun to make healthier choices on their own. Although our program is simple it is also challenging. During challenging times such as farmers arriving late, unhappy teachers, or picking off aphid after aphid from pieces of kale, we must remember this produce is real, fresh, locally grown, and cared for. It is produce, not plastic.